When you think about it, Cloud computing is the future of the internet and business and it’s a wonderful development that is changing our world forever. However, many law firms are still confused and nervous about the Cloud and specifically running their practice software in the Cloud. Seems like everything is in the Cloud these days and it’s the new buzz word for all things mobile, whether it’s Android or Apple, smartphones, tablets or phablets. Cloud offers you the ability to use and discover all sorts of apps and to store their data, photos, music etc. safely in the Cloud. 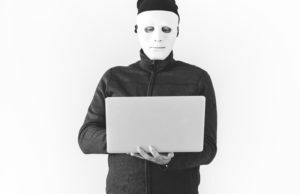 If it’s software in the Cloud and you pay a subscription fee, you could be tricked into thinking it is true Cloud software, however, nothing could be further from the truth and it could be just your old software retro-fitted into the Cloud. There are lots of well-known brands with old legacy software doing this today and being unaware of the difference between the two could be disastrous for your business, particularly if you are a growing business. So, let me elaborate and hopefully clear up some of the confusion around what is retro-fitted legacy software and pure Cloud. It is made up of thousands of different elements – like tiny droplets. These droplets represent all the “things and services” that work together, interact and share resources, like all the water droplets making up a cloud – hence the name. The physical Cloud is all of the data hosting centres worldwide. The popular and well-known ones are Google, Amazon, Microsoft and RackSpace. We access the Cloud or Data Centres through the World Wide Web and much of this access is today via Wi-Fi that is in nearly every home, office, hotel, airport, shopping mall etc. and we do this using our smartphones, tablets, phablets, laptops and PC’s. We refer to this Cloud as the Public Cloud. As a business user you might access apps like LinkedIn, Bloomberg, CNBC, TED, and you might also be an avid digital marketer and tweet and write blogs and follow various Influencers to stay up to date and on top of your game. Business promotion using digital marketing tools is available and easy to do from any device, any time and from any place. All of this is possible because these apps and tools have been designed and developed specifically for the Cloud, I call this Cloud Software and it’s available through the Public Cloud. Much of your daily web, phone, online activity happens or is managed through Cloud services and applications without you even being aware of it, and this is only going to increase. The difference between legacy software in the cloud and true Cloud software. You may well ask, why do I need to know the difference? Believe me, it’s important that you understand as the future success of your business may depend on it, particularly if you are expanding and growing your business. By way of example, if you designed and manufactured a car 40 years ago then you might not have considered important items such seat belts, headrests and airbags. Even 20 years ago you may not have considered CO2 emissions, fuel economy, hands free phones, isofix for baby seats etc. In each case the designers of cars in that era built beautiful cars that met the needs and customer desires for that time. The challenge today would be to retro-fit these vintage cars with next generation elements – isofix, Bluetooth and clean fuel processors. It would be near impossible given the advances in technology, manufacturing and regulations. Software is no different. A piece of software designed 20 to 30 years ago didn’t know about smart phones, tablets and phablets; never mind the concept of cloud computing. An application that is 20 years old is probably very feature rich today because the developers have spent 20 years adding elements and patches and the result is that it has become very bloated and difficult to maintain. This legacy software was designed to run on a PC or Server, sitting in an office/business premises, on a local area network. Upgrades and bug fixes were performed manually by an IT company under an annual maintenance support contract and data corruption normally required the software authors to intervene to repair the data. Any feature enhancements and 3rd party integrations were planned over a 3 to 5 year timeline depending on the software roadmap. What’s even more painful is when 3rd party software is added it sometimes prohibits the user from taking advantage of the updates. Scary, isn’t it? Can you retro-fit legacy software into the cloud? Yes, but with great difficulty. Of course, it’s possible to retro-fit this software on the Cloud with sufficient additional software being applied to the original legacy software. Essentially you have to make this legacy software think it’s running on a standalone PC or Server in an office and you do this by topping and tailing the legacy software with other software; software that sits between the data centre servers and the legacy software and software that sits between legacy software and the device you are using to access the software. This new environment is complicated and specific to a customer, and is referred to as the Private Cloud. A separate instance of this environment is setup for each customer who would then be referred to as a Single Tenant. Now, in this new environment (Private Cloud) you have more software than you ever had before. That means more software to maintain and patch for bugs, which is even more difficult to add new features to or upgrade; and logically more expensive to maintain. And after all that effort, time and expense this new software is still not at all ready for the next wave of new devices that will hit the market – it’s your vintage car that won’t know what to do with Bluetooth or GPS. In addition to all this the legacy software will not take advantage of one of the biggest benefits of Cloud computing and that’s horizontal scalability. Scalability is vital for any growing business so it can manage and cope with larger amounts of data or faster performance. 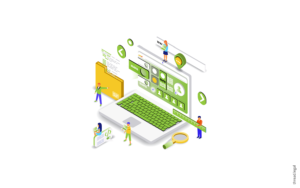 Your “top and tailed” retro-fitted legacy software stand up to your increasing productivity demands and sadly won’t be able to take advantage of the benefits of Cloud computing. A final point to mention is that this legacy software will need more broadband bandwidth to work efficiently, so if you do not have a high- speed broadband connection then you’ll be adding frustration to your list of complaints. Many software suppliers will say their software is in the Cloud and they will prove this by offering you a monthly subscription plan which would normally indicate a true Cloud software subscription model, however, it could be the old stuff retro-fitted to the Cloud. all the worries associated with no regular backups, arriving into the office to finding that a hard disk drive has failed etc. Now you get the comfort that your data is maintained in the Cloud and accessible anytime, anywhere. Using the Cloud simply allows people to access shared software through the internet – a multi-tenant environment. Microsoft Office 365 is an item in the cloud. Some of its features include SharePoint, Skype for Business, Outlook, Excel etc. Some examples of Cloud software in the legal space are Clio, Rocket Matters, Practice Panther, and of course Thread. Thread is also an item in the cloud which works with and interacts with Microsoft Office 365 – and its features. 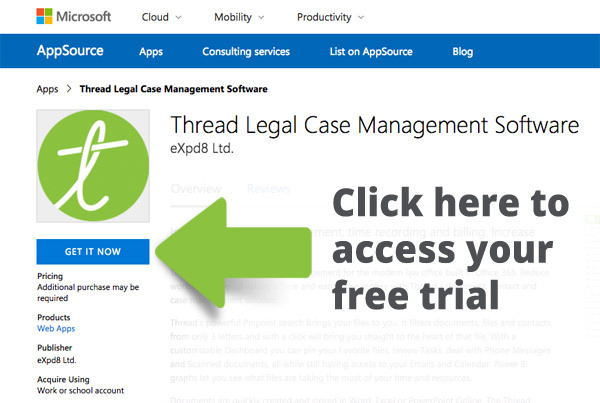 In the case of Thread, this is a pure cloud case management system built in Microsoft and therefore can offers the solo practitioner, the small to medium sized firms, and in-house counsels superior case, document and email functionality at a disruptive price. We’ve harnessed the power of Microsoft by developing Thread on the Azure platform to ensure that it’s pure Cloud. Easily connect and integrate to 3rd parties, carriers, ecommerce, and payments companies etc. Servers are off-premise, secure and stable. Software updates are rolled out seamlessly, with no interruption to you or your business. The Cloud complies with all privacy regulations. Your data is held in and accessed from your local data centre. Microsoft is the leader in Cloud infrastructure – it already provides small and large enterprises with government level security. With end to end encryption it safely transfers your data to you, your colleagues and clients. Protection under the umbrella of Microsoft security helps users stay clear from evolving cyber security threats. 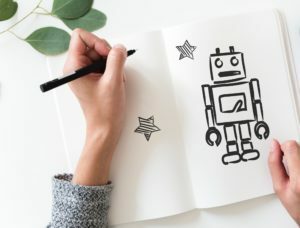 With true Cloud software you are future proofing your business until someone like me is writing a similar article in 20 years’ time saying similar things about Cloud Software! I would welcome any feedback or comments. 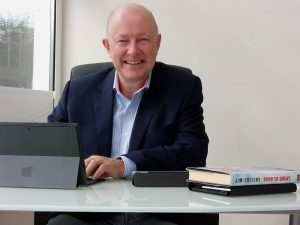 Liam has over 35 years experience working with ICT companies in Europe and operating at CEO level with ICT businesses in the UK & Ireland. Prior to joining eXpd8, Liam was CEO Europe VersAccounts, CEO Sage Ireland and Sage Global CRM. A passionate supporter of all things Cloud, Liam believes small and medium businesses are now poised to take full advantage of Cloud applications to deliver their Global growth ambitions.